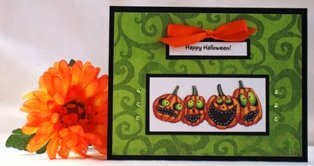 Try these handmade card ideas for Halloween party cards. 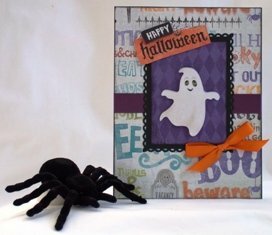 Use cute prints and ghosts embellishments for unique homemade Halloween party invitations. 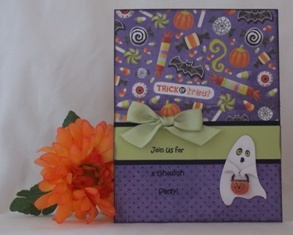 Homemade card ideas can start with pattern paper and for this Halloween invitation, I found a paper stack that had cute prints and coordinating paper to match. For many of my paper card making ideas, I use sketches from an ebook I purchased called 50 Card Making Sketches. Mind you, the paper the author uses is a bit outdated, but I like using the sketches and sometimes alter them a bit, like I did with this Halloween party invitation. I did change the paper size of the sketch so modify the sizes of your card pieces if you are going to follow my hand made card ideas. 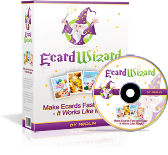 The ebook includes instructions on how to make the cards so that's another benefit of the ebook. I print my sentiment on my computer for many of my Halloween cards and invitations and for this handmade card making project, I printed the sentiment on clear labels and then adered them onto my Halloween invitations cards. For many of my homemade greeting card ideas, I have to put ribbon so I added a green, grosgrain ribbon over the sentiment and then adhered a dimension ghost sticker to the side. 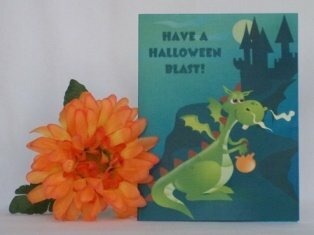 Making your own Halloween party invitation cards is fun because you can design your invitation with your theme and colors. 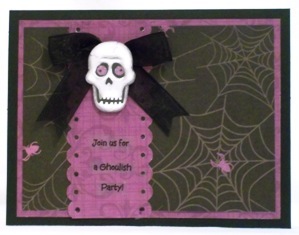 Here's a simple Halloween invitation card. I used a scallop border punch to create the black strip. The skeleton is a die-cut shape and I added foam tape to the back. 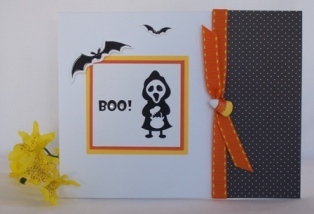 This design is versatile and can be made into just about any card for most occassions. The sentiment was created on my computer and printed on clear prinable labels.